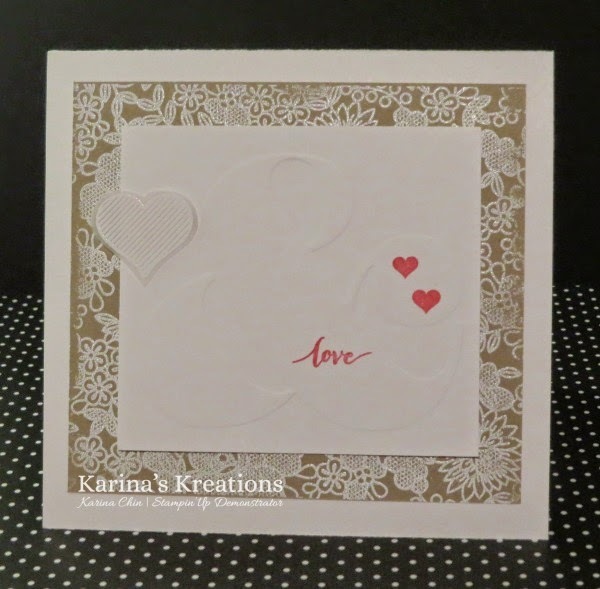 Karina's Kreations: Stampin'Up Something Lacy Card! My friend Janet hosted a stamping lunch yesterday and this was her make and take. She stamped the new Something Lacy background stamp with White craft ink on Crumb Cake card stock and embossed it with Whisper White Embossing Powder. The "love" from Hello Life was stamped with Melon Mambo ink on top of the Embossed Ampersand image. A heart was embossed on Vellum card stock and cut out with Paper Snips. I forgot to add my Pearls but I still think this card is super cute!